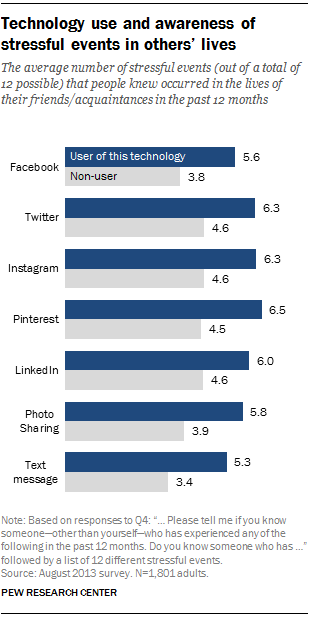 Surprise, surprise, there’s cost and benefit when it comes to using online technology. The good news is that what you’re already doing (reading email on your phone, surfing Facebook, sending pictures) isn’t adding additional stress to your life. In fact, for women, using the Internet and social media might actually lower stress (more on this later). But according to a new Pew Research Center study, if you see a friend post something stressful about their life online, it can, in turn, make you stressed. The study calls this “the cost of caring,” lending to the theory that stress is contagious. 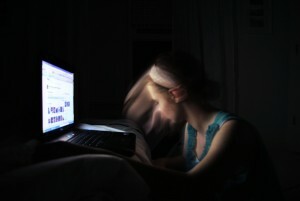 So, people aren’t stressed when using online technology and yet, using it can lead to stress? The researchers say the link between the two is indirect. The physical act of using social media doesn’t appear to add to stress in a significant way. But the “social use” of digital technology, or it’s ability to connect you to other people’s problems results in stress. But let’s turn back to women. Doesn’t using certain types of social media actually lower stress for them? To explain how digital technology use can disproportionately affect women, Hampton first described the “triple burden” many women carry. They deal with paid work as employment, family work at home and also the work of maintaining their family’s relationships within the home and outside with others. But while the advantages of using technology may be true for both men and women, it may be even more beneficial to women because of the “triple burden” some carry. Because not only do women interact more with others digitally and are then exposed to more negative events, women “have a base line higher level of stress,” said Hampton. “They’re more aware of social events — positive and negative — happening in people’s lives. When bad things happen to people, the associated stress is more likely to rebound against women.” This can also happen with “positive” life events. While weddings, job acquisitions and family growth are heralded as constructive life steps, they’re also linked to stress. If observing negativity in the virtual world leads to stress in our actual life, why risk the exposure? When people are exposed to a negative life event in acquaintances’ lives, they feel lower levels of stress. This isn’t to be confused with “schadenfreude,” or the pleasure derived from the misfortune of others. Instead, observing negativity far enough away in the digital sphere is actually a reminder that things could be much worse. Left: Using online technology doesn’t make you stressed -other people do. Photo by Flickr user Ashley Campbell.